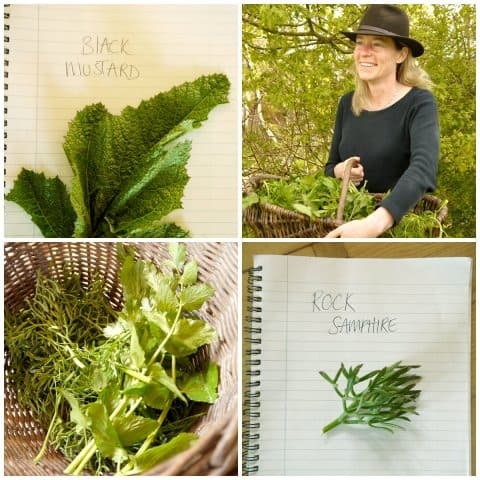 Last summer Jonny & I met Caroline Davey from Fat Hen, a foraging & wild food cookery school, at the Rock Oyster Festival. 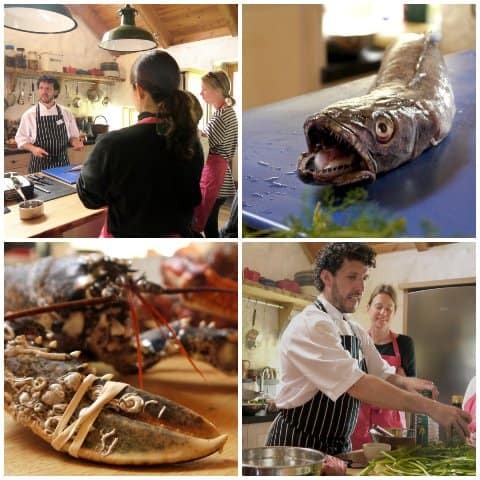 I was over the moon when Caroline emailed me a few weeks ago to ask if I’d like to join & review the first Fish and Seafood Cookery Course of the year. I knew I was in for a treat! 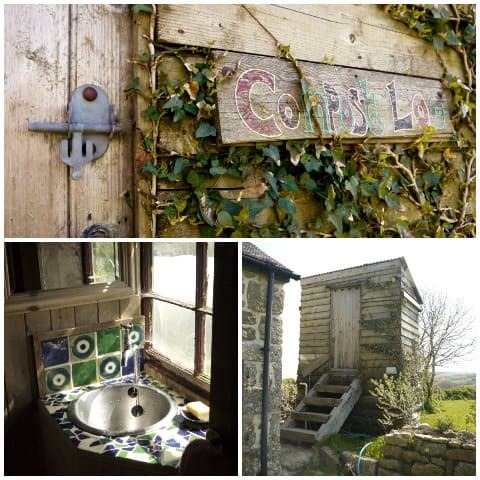 The school is in a delightful barn conversion next to her home on the far west tip of Cornwall, just a stones throw from Lands End. Really cleverly designed, the purpose built kitchen is brand new and caused envy among many of us students! Sunlight poured in all day long which made it a fabulous space to work in. 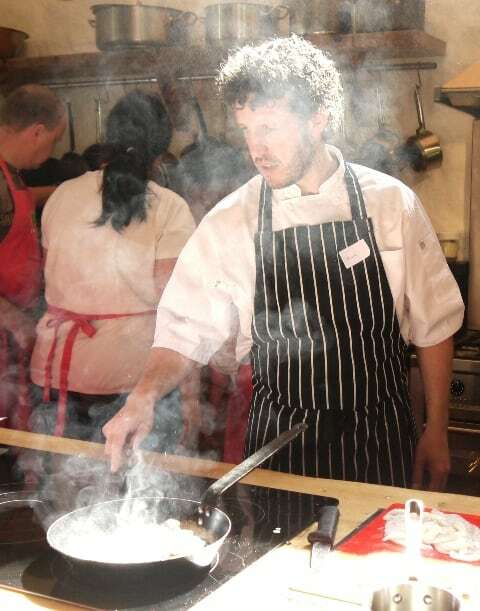 Our chef was Mark Devonshire, who ran Rick Stein’s Seafood School in Padstow for several years. His teaching manner is relaxed and fun and he kept us as entertained as he did well fed! From filleting plaice to cleaning cuttlefish and picking crab and lobster, the course was as hands on as you wanted it to be. Throughout the day we prepared, cooked and nibbled on everything from tempura cuttlefish (utterly divine and not at all rubbery) to a striking black tagliatelle that Mark dyed with squid ink. If you ever buy and cook squid, try to get hold of cuttlefish instead next time, apparently it is half the price per kilo of squid. It’s prepared in just the same way as squid and tastes wonderful. As if all the nibbling wasn’t enough we were also treated to a three course lunch using the seafood we’d prepped during the morning and balanced perfectly by Caroline’s wild food offerings. 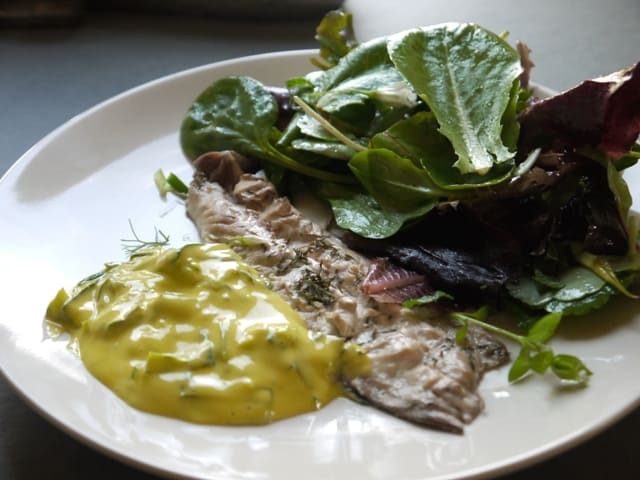 For starter we had mackerel that we’d smoked in a stove top smoker, with a green salad of mixed wild & cultivated leaves with some freshly made wild garlic aioli. A glass of chilled white complemented this rather perfectly. 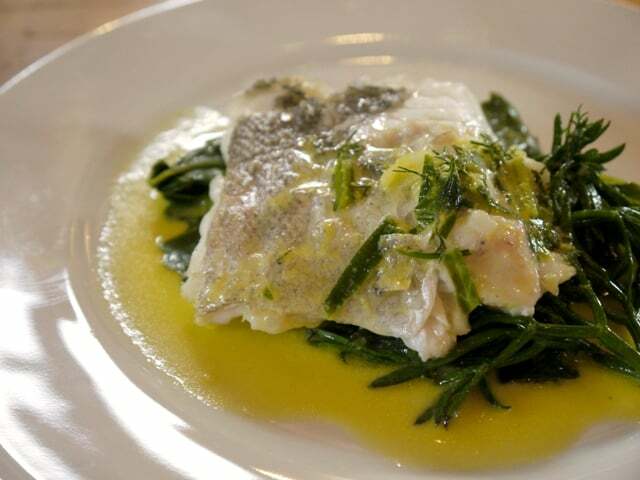 The main course was Hake on rock samphire & wilted wild greens with a rich cream and wild fennel sauce. As usual I had to be difficult, and as I couldn’t have cream Mark made me a sauce with a fresh fish stock mixed with a little of the wild garlic aioli. That’s a handy hint for any other dairy free types, mix mayonnaise or aioli with a little warm stock for an instant creamy sauce. Genius! Dessert was Japanese Knotweed that had been poached in a syrup of sweet geranium leaves, and the dairy lovers had a scrummy looking panna cotta which Caroline had set using carragheen (a seaweed) in lieu of the more usual gelatine. And then, after a serious lunch and gossip with our fellow students, we were put back to work! Honestly, I could’ve just curled up on the sofa at this point! 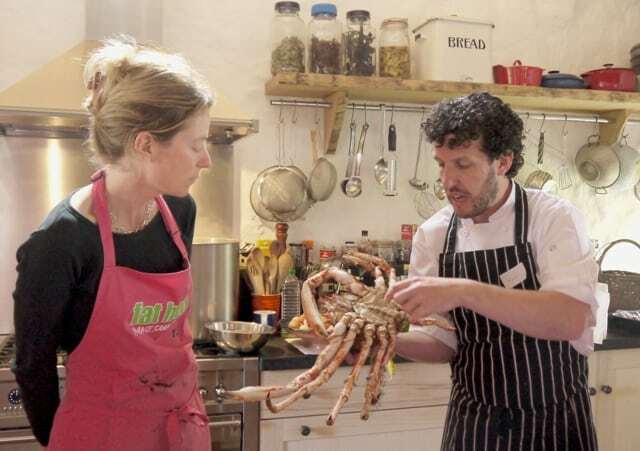 Mark cooked up a spider crab, a brown crab and a lobster which he then proceeded to show us how to break into and pick the meat out of. Whilst I’ve eaten all three of these crustaceans before, I’ve never tasted them side by side. The spider crab was a clear winner for most, if not all of us. The flesh is sweet and juicy and utterly moreish. Interestingly, the lobster was my least favourite of the three. Mark obviously thought we all still looked a little peckish as he then mixed the meat from all three through the cooked squid ink tagliatelle and we devoured that too. Seriously, I have no idea how Caroline manages to stay as slim as she does! 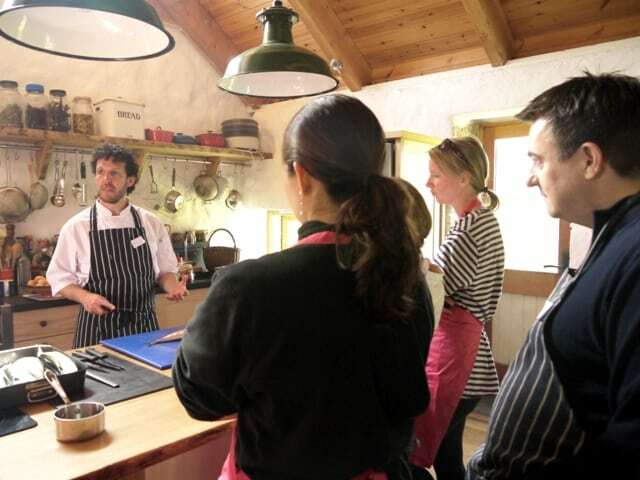 I’ve done quite a few foodie classes now, and can honestly say that this is up there as one of the best. I was exhausted by the end of the day and so grateful that I’d taken notes all day as the tips and information were constant! 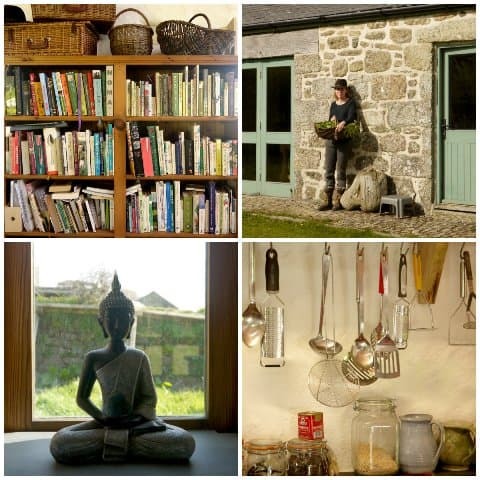 Just having a peep at the Fat Hen website and I love the look of the Seaweed Foraging and Cookery Class, and the Game Cookery day. If I learnt half as much about either of those topics as I did on this fish & seafood day, I’d be very happy. 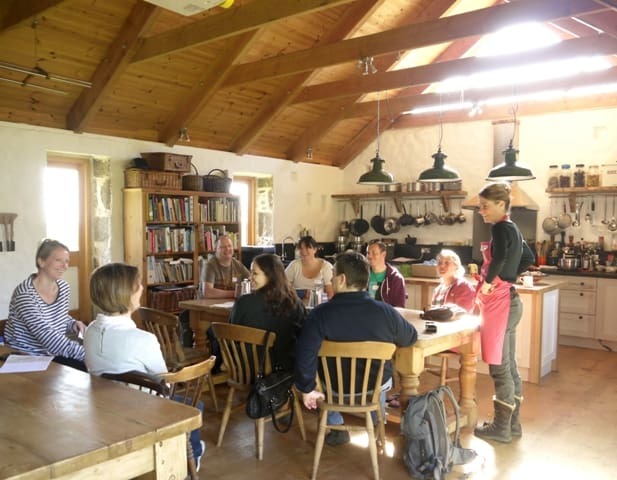 Massive thanks to Caroline for inviting me to experience a day with the Fat Hen Wild Food Cookery School. As always, all views are my own. It’s good to know how much great stuff is available across the UK – not just in London. 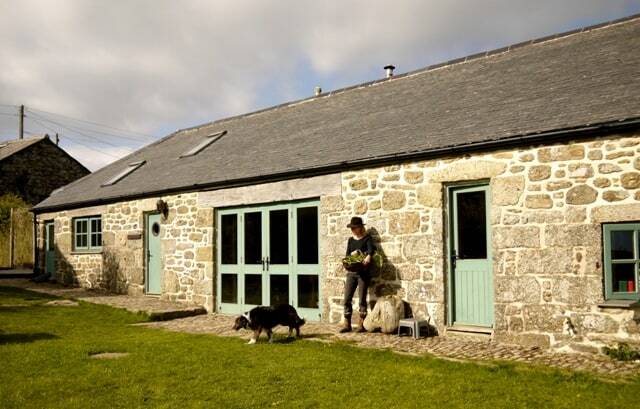 And with Cornwall seafood – that looks perfect! What a lovely day. 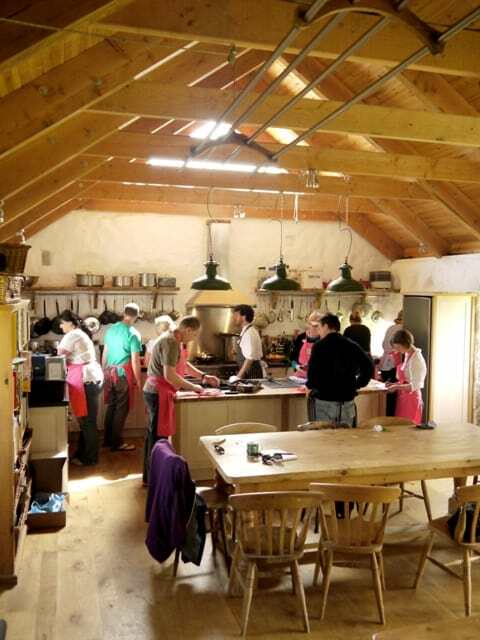 And that kitchen looks wonderful for a cookery school. I think it is a great idea to carry on cooking after lunch, so many schools make you cook all morning and you do not eat until gone 2, at which point I am both tired and starving hungry. There was no time to get hungry Helen, we didn’t sop eating all day long! It was a great day GG, and in a part of Cornwall that I rarely visit but is breathtaking. Hi, In your post it says you ate Japanese Knotweed for dessert??? I am thrilled because I have heard various different bits of advice from different people saying it’s poisonous and I was convinced that it wasn’t. I am really keen to find out what bits you can eat and where I can find some recipes. The course looks fabulous. Hi Kay, we sure did & it tasted great! I believe it was the stems that Caroline poached. It does contain the same acid as rhubarb & sorrel which can cause some people problems. Also in the UK the council sprays patches of Japanese Knotweed trying to eradicate it. You certainly wouldn’t want to eat the stuff that has been sprayed! 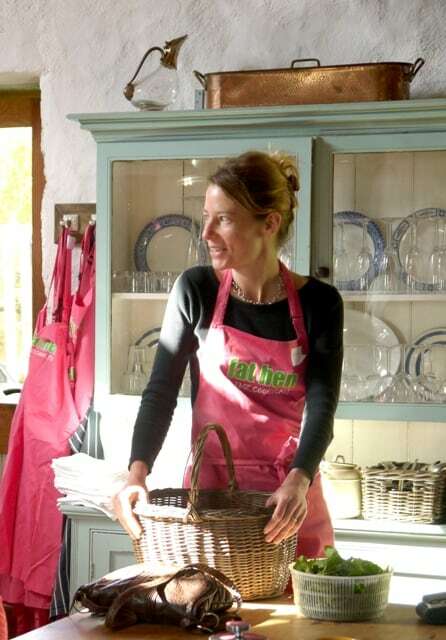 However, I am no expert so please contact Caroline at Fat Hen, as she is the font of all knowledge when it comes to wild food! This sounds like a great place and would be great pressie for a foodie to attend there. Oh yes, what a perfect gift for someone! Apart from that scary looking fish – that is my dream kitchen and it seems like you hd a fab day. The dessert sounds really interesting – think you are going to feature it on your blog any time soon? 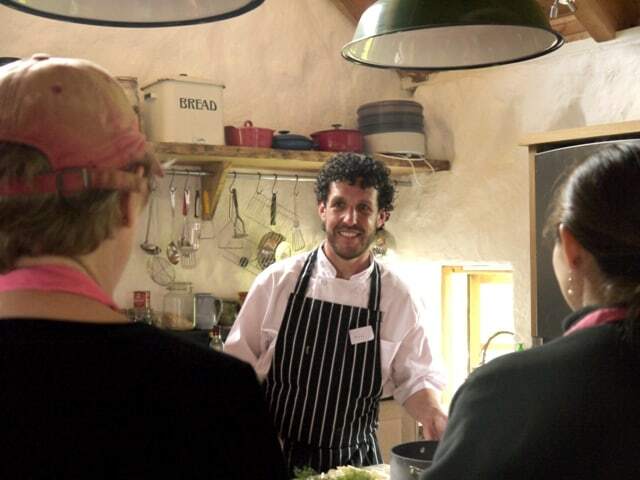 I had great fun at a foraging and cooking event with Caroline (who lead the foraging) and Mark (who did the cooking class) a few years ago. 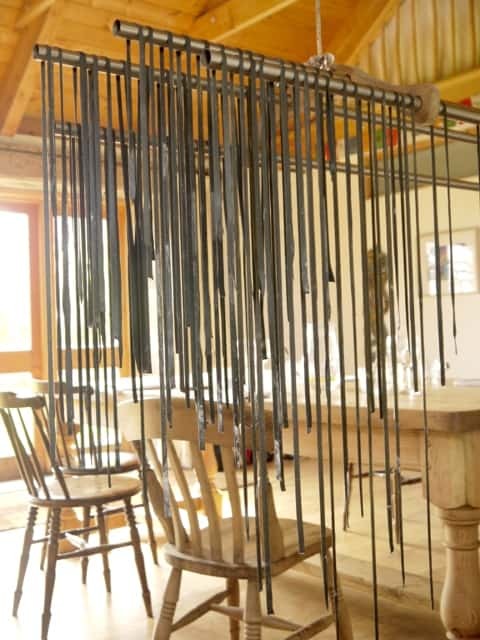 Lovely space, lovely relaxed atmosphere and great fun! Hey Kavey, thanks for taking the time to leave a comment :) Isn’t she/he/the place wonderful! I had the best time and can’t wait to go back again soon! Are you doing anything with fat Hen this year? I am so tempted by the game course. This sounds like a great experience, I love the sound of those dishes and I could really use some more knowledge of how to cook seafood. That crab looks prehistoric! Doesn’t he just! I’ve never seen so many barnacles on a crab or lobster before! Wow, what a fabulous day and right up your street. Your photos are just fabulous. Great post. Thanks Choclette, I did have a blast!